Inventory We are a resale marketplace, not a box office or venue. Ticket prices may exceed face value. This site is not owned by Bayfront Park Amphitheatre . 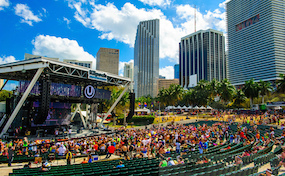 The Bayfront Park Amphitheatre, formerly the Klipsch Amphitheatre at Bayfront Park, is the biggest outdoor summer concert venue in the city of Miami. The pavilion has a seating capacity of 10,000. The Bayfront Park Amphitheatre box office is located at 301 North Biscayne Boulevard in Bayfront Park. On site there is also the Tina Hills Pavilion which has a much more quaint seating setting with less than 1,000 total. Bayfront Park concert tickets have included acts like Bob Dylan, Smashing Pumpkins, Incubus, and The Cure. AmphitheaterMiami.com is not affiliated with any official website, venue, promoter, and or supplier. We are an independently owned and operated company that deals solely in the online retail of all events in the secondary ticket market. Prices on our sites may be above or below face value and will change quickly with market conditions. To order your tickets for all Bayfront Park Amphitheater Miami events please follow the steps online through the checkout.